One of the many use cases of OCR is to extract data from images of tables - like the one you find in a scanned PDF. Other document types like receipts, invoices, contracts and more also follow the same layout and also benefit from our table OCR feature. For all these documents we recommend that you enable check the Receipt scanning and/or table recognition option on the front page. If you use the OCR API, you get the same result by turning on the table OCR mode. The result is that the OCR'ed text is sorted line by line - just like you find it in the table. This makes the OCR API the perfect receipt capture SDK. 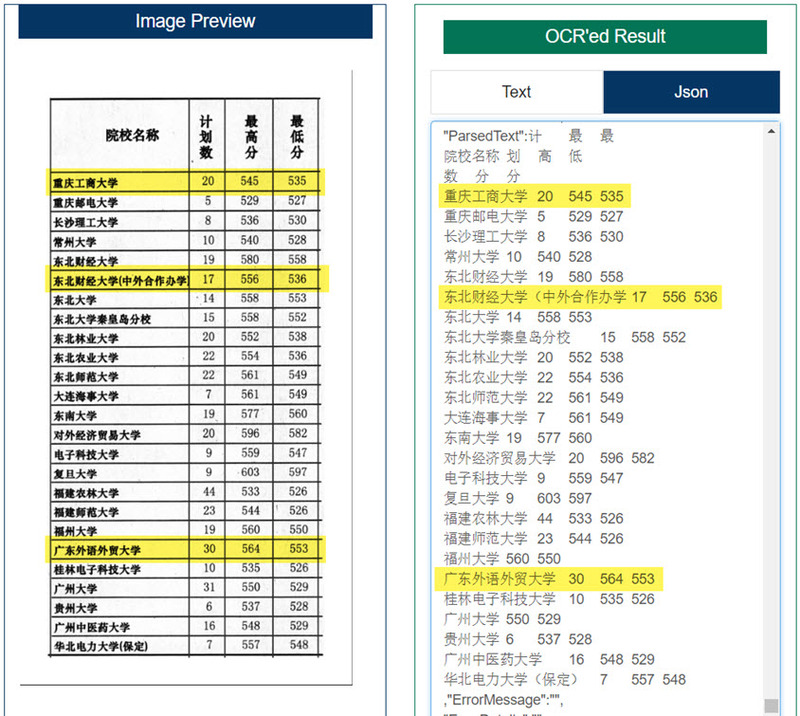 The screenshot below shows the OCR result of an image of a table scan, in this case from a Chinese text book. With the table OCR mode active, the structure of the text output is the same as on in the table. We highlighted a few lines in yellow to visually help you to compare the left input image and the extracted OCR table data on the right. The link to the table image is https://ocr.space/Content/Images/table-ocr-original.jpg - just paste it into the URL box on the front page. Try Kantu, our OCR-powered Task and Test Automation RPA software. It is available as free browser extension for Chrome and Firefox (OSI-certified Open-Source) plus computer-vision extension modules. Kantu is fun to use - and its Cloud Vision OCR features are powered by the OCR.space OCR API. Do you have an OCR API question? Please email us or visit the OCR API Forum - we love to answer OCR questions.